problems -especially copyright protection- remain. 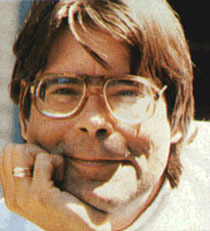 Best-selling author Stephen King kept returning to the darkest corners of the soul in his writings. But when it came to the new world of electronic publishing, he pioneered virgin territory. In March 2002, the master of the macabre sold more than half a million copies of his 66-page electronic book, Riding the Bullet, through the Internet for just $2.50 a pop. After that, King did something more radical. Later that same month, he sidestepped publisher Simon & Schuster Inc. altogether by releasing installments of his new novel, The Plant, direct to readers from his own Web site at $1 per episode. ''It's the ultimate experiment,'' said King's agent, Ralph M. Vicinanza. Already, a handful of industries are revamping in anticipation of the switchover. Publishers have digitized thousands of titles and are working to establish standards before the end of the year that ease distribution while preventing the threat of piracy. (Thieves stole copies of King's Riding the Bullet and posted them on Web sites for others to filch.) And tech companies are working to make e-books more palatable to readers, whether on computers or special e-reader devices. If this new medium takes off, the biggest winners could be the authors. While the publishing industry is quick to coddle and promote stars, it often has little time for those who don't rack up big sales. Indeed, the Net exposes the flaws of traditional publishing. Of course, the promise of e-publishing isn't quite fulfilled yet. While it may offer wonderful opportunities for readers to see work that traditional houses would never touch, it also threatens to overwhelm them with unreadable junk and provides little help in separating the gold from the dross. E-publishing also means speed to market. Instead of waiting months for publication, King got Riding the Bullet out mere weeks after penning the last page. Because of the low cost of electronic distribution, the Net allows authors to cater to smaller markets than is generally possible in print. As technology improves and a new generation of readers gets comfortable with e-books, more writers will surely follow King and Clark. Important work will get published online. And someday, traditional book publishers may go the way of the medieval illuminators. Now, that's a macabre thought worthy of Stephen King.